When Should I Replace My Home Windows? 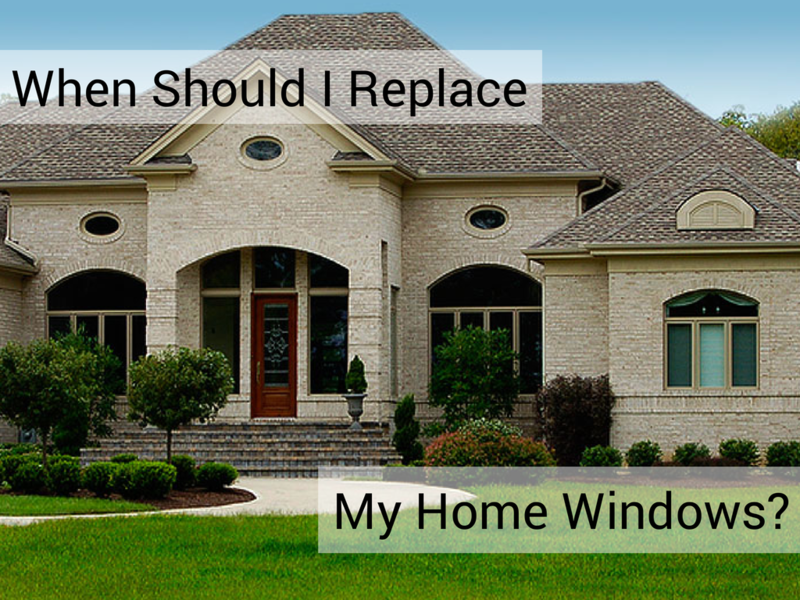 Home » Blog » Window Replacement » When Should I Replace My Home Windows? You may be wondering if it’s time to replace the windows in your home, but knowing whether or not your windows are due for an upgrade isn’t always as clear as it may seem. The problem is that you may not be able to tell your windows need replacing just by looking at them. After many years, windows, just like other home components, get worn and deteriorate without being visually obvious. There are many benefits to getting new windows for your home, but since many homeowners usually put off replacing them due to cost, the dangers of not replacing damaged windows will cause you to lose a lot more than just the price of the replacement windows and their installation. Here, we’ll help you to determine if your windows need replacing by checking a few simple areas on and around your windows and home. A surefire sign that your windows need to be replaced is if they have satisfied their projected lifespan. If your home is older than 15 years, it’s probably a good time to check and make sure your windows are still functioning effectively and correctly. For example, do you have difficulty opening or closing your windows? Do you regularly find moisture on your windows’ interior? According tothisoldhouse.com, aluminum windows are expected to last between 15 and 20 years while wooden windows should last upwards of 30 years. Leaf blowers, trucks or noisy neighbors driving you berserk? Is your home near an urban neighborhood, airport or busy street? If your home takes in all the noise from the street, even when all the windows and doors are shut, this is known as ‘noise pollution.’ You’ll be surprised to find out how significant the reduction of exterior noise is once you replace your windows. Replacing your windows with dual-pane or a laminated glass can reduce the noise transmission into your home. A prettier solution that still involves fresh air and light: You can replace double-pane, or double-glazed, windows with triple pane. Alternatively, if you’re not looking to replace your windows, but simply reduce noise pollution you could try acoustical seals that make it possible to add another layer of airtight glass in front of your existing window. However, once installed, your window won’t open anymore. Has your heating or cooling bill along with your energy bill spiked recently? That might indicate that there is heat exchange occurring between your home and the outside. If you’re home still has single pane windows, or if you experience noticeable drafts or moisture near your windows, then your home isn’t as energy efficient as it should be and your windows are a part of the problem. Replacing them with dual- or triple- pane windows that are designed to provide the ultimate protection against the elements is necessary. In addition to protection against wind, temperature changes and moisture, they also provide UV protection. It might seem odd to check these areas of your home, but the ultraviolet rays that enter your home through your current windows might be your furniture, carpet, window treatments and artwork to significantly fade. Materials like this or ones made with organic fabrics, are susceptible to fading when exposed to sunlight. Replacing your windows to more energy efficient products can potentially reduce fading and extend the life of your personal and household items. If one or more of your windows has large cracks and missing pieces, extensive rotting or pests, you definitely need to go the replacement route before these issues result in costly wall or interior damage caused by moisture pooling and mold. Check window casements for chips in wood, rotting or broken pieces, missing pieces and growth of mold and mildew. When window casement is not firm, the glass is at risk of being broken if something accidentally hits it or when the weather is colder. You should also replace windows that have mold on the seals or condensation in the form of fog or ice crystals between the panes, as these are indicators of seal failure. When seals fail, these types of windows are not only less energy efficient, but also extremely unhealthy because of mold growth. If you find any sort of damage on your windows then your windows need to be replaced much sooner than not. Although replacing windows is an expensive proposition, the cost of practicable, efficient windows is well worth the investment. For more information about window replacement options, advice about your current home windows or answers to additional questions, contact our knowledgeable, experienced staff today! One Response to When Should I Replace My Home Windows?